This entry was posted on Tuesday, August 2nd, 2011 at 8:11 amand is filed under . You can follow any responses to this entry through the RSS 2.0 feed. You can leave a response, or trackback from your own site. mesmerizing photo and thoughts …always ..
Now I’m going to have to ponder on that one a bit. First I took it literally and was all stumped now I think I get it. Not what you see but what you do about it. Potent poem in a small package, well done. A lot wrapped in this small package. Each word is used to maximum effect. Pretense, mirage, self-deception, be careful what you’re willing to swallow. somehow ‘mute repercussions’ made me think of choking… and not believing what others may try to cram down our throats. Maybe I’m trying too hard here… but you’ve got me thinking! Very thought-provoking; I love the image. Thanks for sharing. So short but packs a powerful punch. Lots of hiiden depth to it, too. Interesting combination of soft image in the photo and first part, combined with a simple fact in the last. In all, a very effective bit of verse. Well, I’ll bite (pun intended) and do the rorschach test. 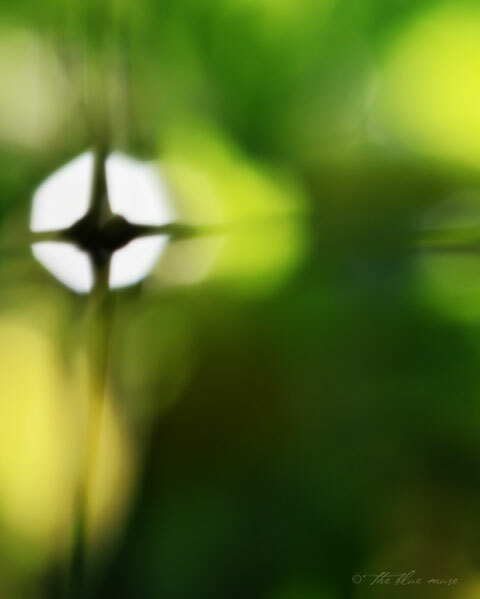 The blurred image created a cross with a bit of a halo at the center. So it might be about whether one swallows religious belief? … Dunno. But intriguing. I would love to write this simply and eloquently! Love these small pieces of finely tuned dynamite!! I love the shades of green, lovely.